Thousands of farmers belonging to the Lakbayan ng Visayas inter-island protest caravan swarmed the streets of Cebu today to decry government neglect of Visayan farmers. Tenant farmers, fisherfolk, and sugar workers from the Visayas are among the most destitute in the country. The Lakbayan protests emphasized that Duterte’s unfulfilled campaign promises, and the neoliberal policies and imperialist impositions in the economy cause further dislocation and extreme poverty in local peasant communities. Over a thousand sugar farmworkers from Negros under the National Federation of Sugar Workers-Unyon ng mga Manggagawa sa Agrikultura (NFSW-UMA) spilled to the streets as they occupied the façade of the Department of Labor and Employment (DOLE) Region VII office. 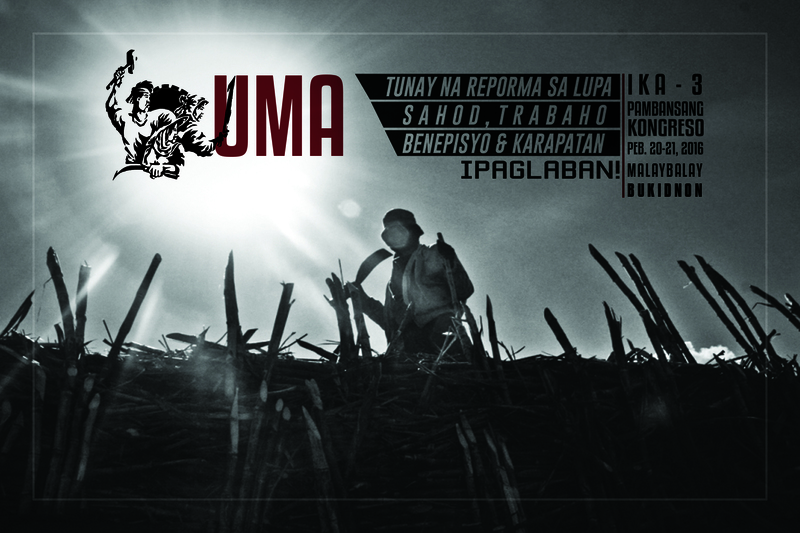 According to John Milton Lozande, UMA Secretary General, sugar workers decry the DOLE’s performance, if not outright complicity in the anomalous implementation of the Social Amelioration Program (SAP) in the sugar industry. SAP is a government program enacted in 1991 through RA 6982. It provides for bonuses, benefits and socio-economic programs for sugar workers. During the dialogue with DOLE officials, NFSW Chairperson Rolando Rillo said that most sugar workers in the region, including Negros Oriental and Northern Cebu, report that they do not receive any form of assistance from the program. “Our problem with SAP is much like the coco levy and tobacco excise tax which the Marcoses have plundered. The government exacts a levy from sugar produce supposedly to help the workers, but our poor farmworkers have no way of taking direct control of the funds,” he said. Rillo added that for the longest time, SAP funds were used by big landlords and sugar barons to further reinforce the feudal patronage system and to fund the private armies of hacienderos that augment militarization in the countryside. A similar program to SAP was first enacted in the 1950s, but was also institutionalized during Martial Law and favored Marcos cronies in the sugar industry. Meanwhile, Lakbayan protesters also trooped to other government agencies this morning. Farmers from HUMABOL-Bohol and KMP-Cebu held a picket at the National Irrigation Administration (NIA) to highlight President Duterte’s empty promise of free irrigation to farmers. Local peasant groups and fisherfolk from Pamalakaya held a dialogue with DENR officials to decry reclamation programs, rampant land use conversion and the anti-people No Build Zone policy. Protests and dialogues with the Department of Agriculture (DA), Bureau of Fisheries and other agencies are scheduled for this afternoon. The Lakbayan protests merged this morning at the US Consulate with the call to end lopsided trade agreements affecting agriculture, US military exercises and military basing across the country and other neoliberal attacks against the Filipino people. “The Duterte regime has proven itself beholden to US imperialist dictates,” said Rillo. “His slogans for an independent foreign policy now rings hollow. He bows down to the US by doing nothing to change US hegemony in the country, while also making our economy increasingly dependent on multi-billion loans from China and other big powers,” he added. “The country will remain backward and our farmers impoverished without genuine land reform. The feudal set-up in the countryside provides continued basis for imperialist leeches to fester,” he ended. The Visayas Lakbayan will culminate here in Cebu tomorrow, October 20, while farmers led by the Kilusang Magbubukid ng Pilipinas (KMP) from Mindanao, Bicol, Southern Tagalog and North and Central Luzon regions will continue to march to Manila for the #LakbayMagsasaka Pambansang Lakbayan para sa Lupa at Laban sa Pasismo from October 23-25.